Published on Saturday, April 2, 2016. This article appears in the February/March 2016 issue of American Craft Magazine. 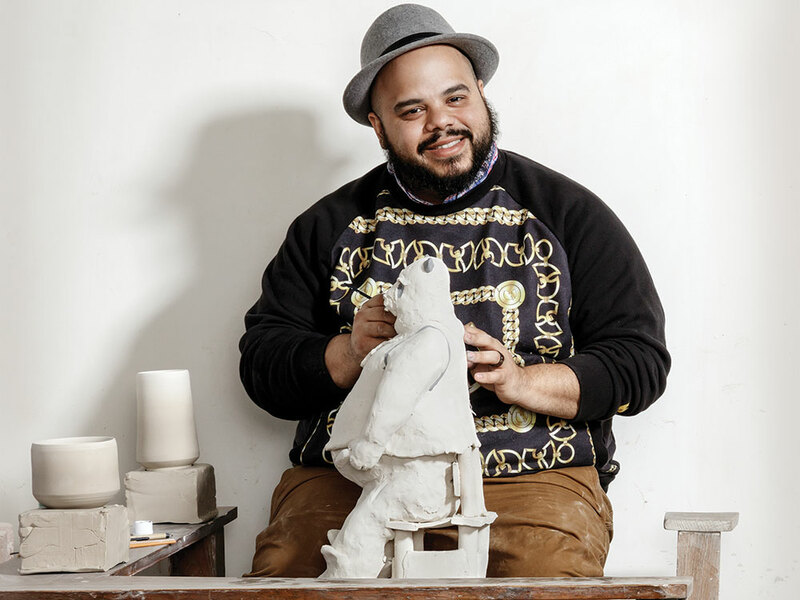 We learn our most profound lessons in childhood, ceramist Roberto Lugo believes, when we are open and wide-eyed and defenseless. And we spend the rest of our lives sifting through those lessons, making sense of them, and responding. We learn very different lessons, of course, depending on where we start out. As children, we’re like the fabled blind men with the elephant, groping in the dark for understanding – where we are placed matters. Some of us are positioned to feel the elephant’s trunk, so we decide that life is a tree branch. Others reach up to feel the torso and infer that life is a wall. Whatever we conclude, those earliest lessons have an outsize impact on us, and we move through life and around the world seeking experiences that deepen and confirm – or leaven and counterbalance – what we learned first. Lugo was his mother’s third child, born when she was 21. He grew up in the Kensington neighborhood of Philadelphia, amid gangs, rampant drug use, and abandoned houses. At an early age, he confronted stark realities about race, poverty, and inequality. Today, those lessons shape his eclectic vessels, which combine urban edge and classical forms. You can feel Lugo working through his formative experiences – reflecting, integrating, elaborating. LJ Roberts is a textile artist who grew up in a stifling, affluent Detroit suburb where conformity, prestige, and achievement were prized above all. Roberts, who uses gender-neutral “they” and “them” pronouns, learned to be wary of those ideals, and, ultimately, to hash out their identity in freer places. 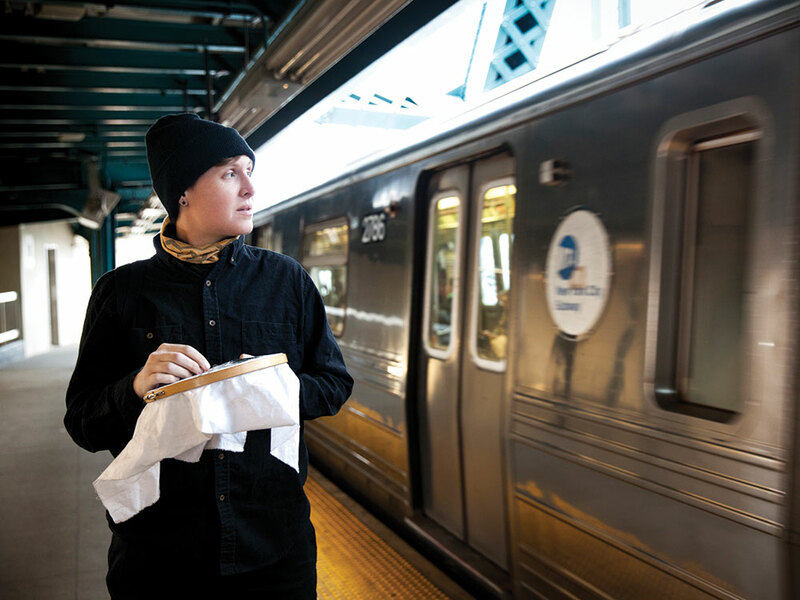 They’ve been on the move ever since – making art in New York City, in the California desert, even in a neighborhood diner and on the subway. Community hasn’t always been an easy notion for Roberts, but when you see their embroidered portraits, you see the connections they’ve made. As a kid, Aric Verrastro took perverse pleasure in the decaying parts of his native Buffalo, throwing rocks with his siblings at the windows of the grand, old, abandoned train station. As he grew, though, he realized that there is beauty in decay – and jubilation in the possibility of renewal, as his hometown experiences something of a renaissance. Today, Verrastro is 31, married, and living in Wisconsin, but he’s still pondering Buffalo. His Timekeepers body of jewelry celebrates the city’s inextinguishable vitality. Wherever we come from, our subjective childhood experiences are our first, big truths. But, as these artists show, there is always more truth to uncover.